Iron City has the Formula for Accuracy! One of our main competitive advantages is our investment in new and innovative RFID Smart Chip Technology – ensuring 100% Accuracy and Transparency in every delivery. A Radio Frequency Identification (RFID) Chip is concealed into every garment, and works as hard as you do! 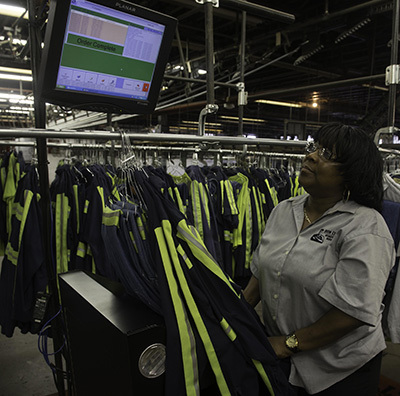 With RFID Smart Chip Technology, each individual dirty garment is scanned into our facility immediately once our truck returns, and after our professional laundering and automatic RFID sorting process, each clean garment is then scanned out of our facility before the delivery day begins. Customers can view completely transparent delivery reports and invoices in their Personalized Customer Portal on our website 24/7. As a family owned and operated company, we understand the important values of transparency and accuracy in a uniform rental program, allowing you to focus purely on your work! It’s Easy. It’s Accurate. It’s Yours…Only from Iron City Workplace Services. Contact us today to hear how RFID Smart Chip Technology can benefit your operation, and save you time, hassle, and money!